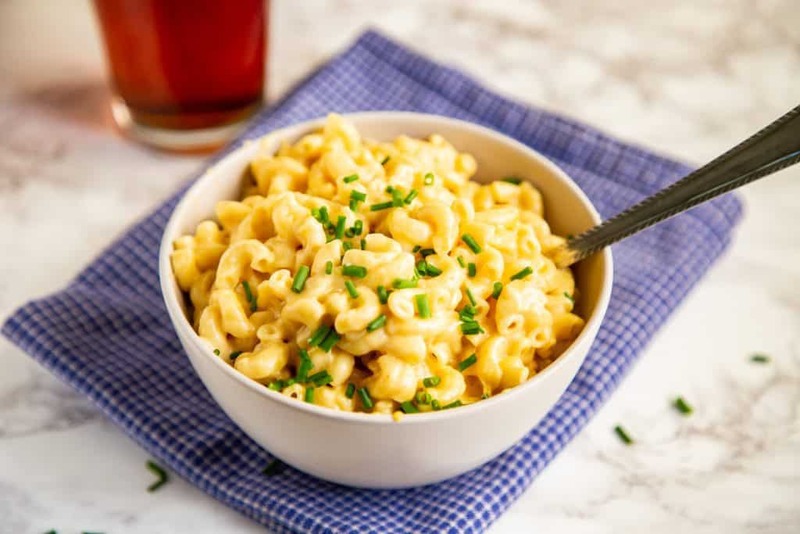 This creamy, smoky, flavorful Instant Pot mac and cheese recipe turns all of the tasty, mouthwatering goodness of traditional baked mac and cheese into a quick weeknight dinner. I love mac and cheese. Who doesn’t? I grew up eating the Kraft blue box mac and cheese. It was probably the first thing I learned to cook by myself. When I was in college I splurged on the Annie’s organic boxes. We even brought a box of Velveeta mac and cheese on a recent camping trip. I can appreciate really good mac and cheese, I just don’t often have the patience to make it myself. For Thanksgiving last year I made mac and cheese as a vegetarian main dish. Since I was going to be the one eating most of it, I figured I may as well make something I like! From start to finish it took at least 90 minutes, boiling water, cooking the pasta, making the perfect roux, and then baking at the end. It was so good and perfect for a special meal like Thanksgiving, but it was definitely not a recipe that I could make on a weeknight. My favorite mac and cheese ever is from one of my favorite Nashville restaurants, Lockeland Table, serving classic Southern food in a rustic, rehabbed storefront setting in East Nashville. Their skillet mac-n-cheese hides on the menu as a side dish, but it’s so good it should be a main dish all on its own. Creamy, cheesy, and smoky, it has the perfect balance of flavors. One day I stumbled across the Lockeland Table cookbook with the recipe for their famous mac-n-cheese and I was determined to recreate Chef Hal’s flavors in a quick, weeknight meal. The recipe in the cookbook serves a crowd and includes a pound of butter and a whole lot of cheese. If you want a rich, party-worthy dish, find his cookbook and make it. Or better yet, just stop by Lockeland Table. Make sure to get the skillet chocolate chip cookie for dessert! But if you’re looking for a quick, weeknight dinner, then make this recipe. I used my Instant Pot, swapping the traditional roux for some evaporated milk. Three kinds of cheese (smoked cheddar, American cheese, and Parmesan cheese) plus a bit of cream cheese make this perfectly creamy and flavorful. I hope you enjoy it as much as we do! An Instant Pot is a brand name of multi-use, programmable electric pressure cookers. The Instant Pot brand offers several different sizes and there are a number of other brands on the market as well with similar features. I have the Instant Pot Duo 6qt, so all of my instructions are based on that one. All of the pressure cookers are pretty similar; they just name things a bit differently, so refer to your manual if I reference a button that you don’t have on yours – or leave a comment in the notes and I’ll try to help you out! Start by adding some butter and water to the stainless steel pot. Add the elbow macaroni, some cream cheese, salt, mustard, and cayenne in that order. Something about the mustard and cayenne helps to amplify the flavor of the cheese. All of my favorite mac and cheese recipes through the years have always included mustard and cayenne or hot sauce in some form. Do not stir. Seal the lid, press the “Pressure Cooker” button until it’s on “Normal”, press the “Pressure Level” button until it’s on “High” and then press the +/- buttons until it says “00:06” (for 6 minutes). Make sure that the pressure release valve is closed. The Instant Pot will beep once and say “On”. Then it will get up to pressure, beep again, and start counting down. When it’s done, turn off the Instant Pot and quick release the pressure by opening the pressure release valve, making sure to stay clear of the steam. When the float valve is down, take the lid off. Press the “Saute” button until it’s on “More” to saute on high. Add the evaporated milk and mix it in. 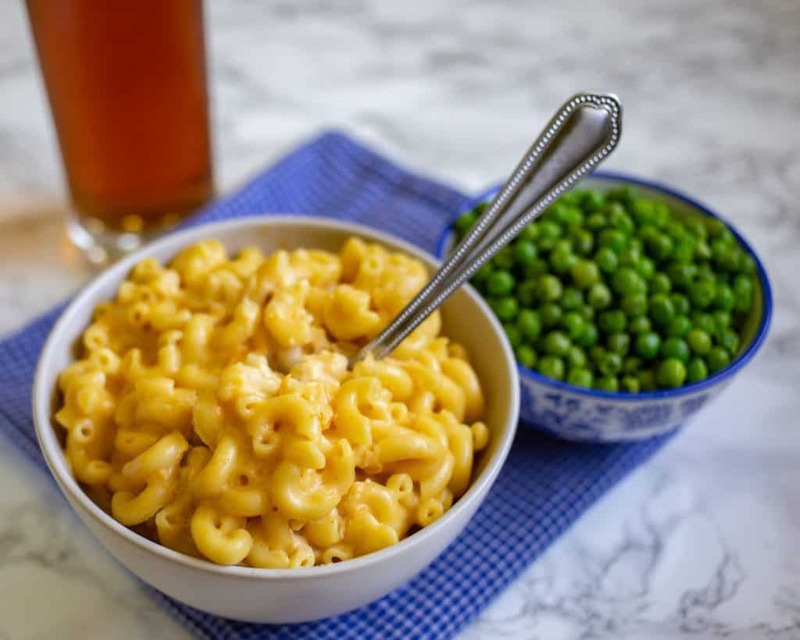 The macaroni may be stuck together and a bit undercooked – this step with the evaporated milk will form the base of a creamy sauce and allow the macaroni to finish cooking. Then turn off the Instant Pot and stir in the cheeses gradually, in about four batches. Season with salt and pepper to taste and serve. Note: If you get a “Burn” notification, don’t worry! It just means that some stuff is stuck to the bottom of the pot. It’s usually happened to me when I haven’t used enough liquid or when I’ve used a tomato- or cream-based sauce that is touching the bottom of the pot. That’s why in this recipe I don’t stir the ingredients after adding them to the pot and leave the evaporated milk out until the pasta is cooked. To remedy the situation, release the pressure, open the lid, and stir well, scraping up any bits on the bottom of the pot. Try turning the pressure cooker on again for the remaining time. If it burns again, then release the pressure again, take off the lid, and turn the pressure cooker on “Saute” to cook the rest of the way. This method may not work well for big cuts of meat but has saved me when creating various rice and pasta recipes. Looking for more Instant Pot recipes? Try this Instant Pot Greek Yogurt, my absolute favorite recipe that I make every week. For another quick, weeknight dinner, try this Instant Pot Enchilada Rice. 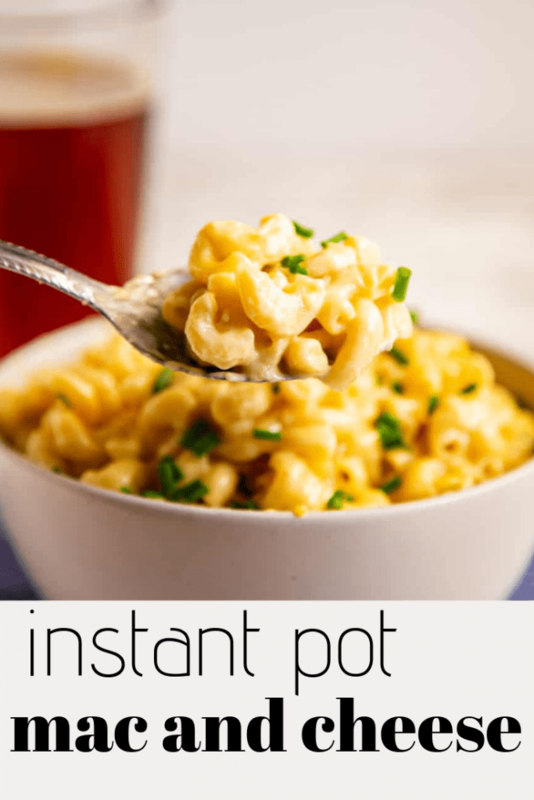 If you try this Instant Pot Mac and Cheese, leave a comment and review below and let me know how it worked out for you! 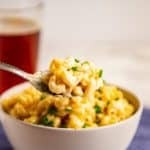 This creamy, smoky, flavorful Instant Pot mac and cheese recipe turns all of the creamy, mouthwatering goodness of traditional baked mac and cheese into a quick weeknight dinner. Add the water to the instant pot stainless steel pan, then add the butter, macaroni, cream cheese, salt, mustard, and cayenne in that order. Do not stir. Lock the lid in place and close the pressure release valve. Press the “Pressure Cook” button until it shows “Normal” to pressure cook on high and then click on the +/- buttons until you’re at 6 minutes. When done, turn off the Instant Pot and quick release the pressure. Remove the lid carefully, allowing the steam to escape away from you. The macaroni will likely be stuck together and slightly underdone - this is completely normal. Press the “Sauté” button until it’s on “More” to sauté on high. Add in the can of evaporated milk and mix together all of the ingredients until the milk has thickened a bit and the macaroni is the right consistency, about 3-5 minutes. Turn off the Instant Pot and stir in the Parmesan cheese, American cheese, and smoked cheddar in about 5 batches until the cheese has melted and the sauce is smooth. Season with salt and pepper to taste. Note: You can substitute other cheeses, just get to 8-10 oz of cheese in total. Other combinations I’ve tried is 4 oz sharp cheddar with 6 oz Monterey jack and 6 oz sharp cheddar with 4 oz smoked Gouda. You can never have to many instant pot recipes! This mac n cheese looks fantastic! You had me at mac & cheese. This looks so creamy and dreamy. I have to pin it and try it! I must get an InstaPot. Your mac and cheese looks really creamy and yummy. I also grew up with the blue box of mac and cheese. Homemade can’t be beat. You wouldn’t think mustard would work with Mac and Cheese but it really does! YUM! This is convincing me that I need an instapot so I can give this a try! 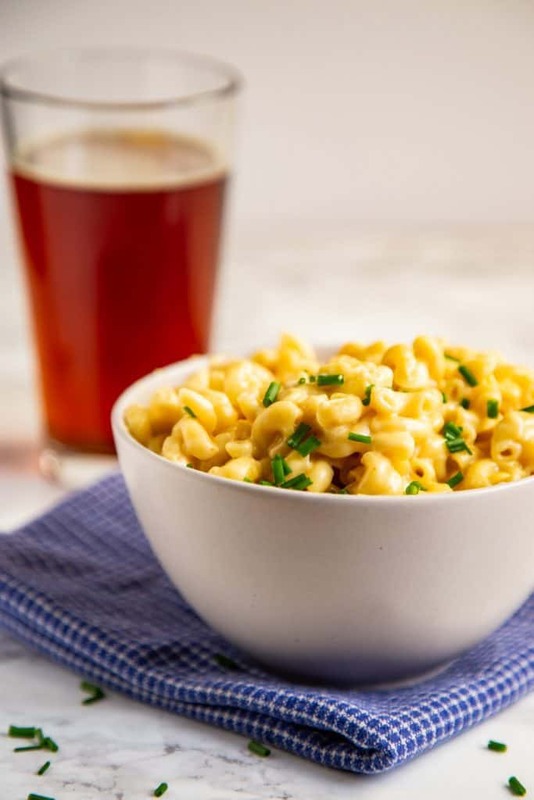 Really love this simple way to make mac and cheese, it sounds great with the smoked cheese too! I love your addition of smoked cheddar and dijon mustard. What a great take on a classic recipe! Always looking for more insta pot recipes. Thank you for this classic. I haven’t tried pasta in there yet….but this recipe with the mustard (genius) really caught my eye. The kiddos are going to love this one! I have to try this. The process makes sense. My other attempts at instant pot mac n cheese have failed. I am going to try it your way. The smoked cheese makes this recipe a cut above the rest. Oh how I lovvvve Mac and Cheese, especially when the Instant Pot makes it for me. We make it alot, but I’m always looking to expand my horizons in case I’m missing anything 🙂 Thanks for the recipe…just pinned!